Here are some of our most frequently asked questions about Social Security benefits. It’s important to note that rules change all the time and not everything is applicable for every person. If you have any questions about any of this material, please call us or the Social Security Administration for clarification. How do you qualify for Social Security retirement benefits? You must have 40 credits of covered work, generally satisfied by at least 10 years in which you had earnings that were subject to Social Security tax or self-employment tax. You must be at least 62 years old (60 years old for a survivor benefit). You may also qualify for benefits as a spouse, former spouse or survivor of a covered worker. Insurance Amount (PIA). Your individual Full Retirement Age is determined by the Social Security Administration, and is based on the year you were born. Can you continue to work and receive a Social Security benefit? You can continue to work and receive benefits. However, if you begin receiving benefits prior to your Full Retirement Age, there are restrictions on the amount you can earn without a reduction of your monthly benefits. Generally, this amount changes on an annual basis. For 2015, the reduction will be $1 for every $2 you earn over $15,720. In the year you reach Full Retirement Age, the income threshold increases to $41,880 and the reduction decreases to $1 for every $3 earned above the threshold. If you wait until after reaching Full Retirement Age to begin Social Security benefits, there is no limit on the earnings you can have and no reduction in your benefits. Your benefits generally are not taxable if half of your benefits, plus all your other income, is less than $25,000 if you are single ($32,000 if you are married filing jointly). If half of your benefits, plus all of your other income, is more than $34,000 (for singles) or $44,000 (married filing jointly), then 85% of your benefits are subject to income tax. If you fall somewhere between the lower and upper limits, then the percentage of your taxable benefits varies between 0% and 85%. Please consult with a tax advisor on your particular situation. How much does your benefit grow if you file later? If you file after Full Retirement Age, Delayed Retirement Credits will be applied and accrue up to age 70. The Delayed Retirement Credit provisions allow for any month for which a worker was at least full retirement age, was insured for retirement benefits, and did not receive retirement benefits. 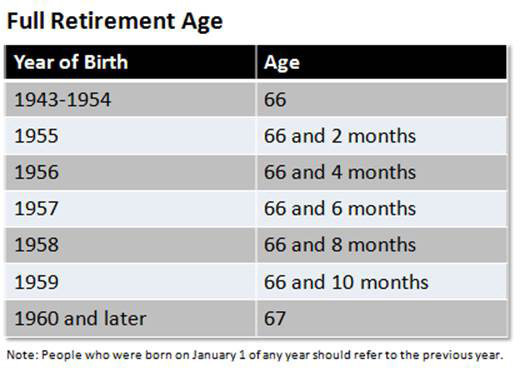 The amount of the delayed retirement credit depends on when you were born, currently anyone born after 1-1-1943, receive a monthly credit of 2/3% or .0066667. That’s equates to a yearly credit of 8%. How much is your benefit reduced for filing early? If you elect your retirement benefits early they will be reduced by 5/9 of 1% for the first 36 months prior to full retirement age. Any month in excess of 36 months will be reduced by 20%, which is the total reduction for the first 36, plus 5/12 of 1% for each month in excess. For example, if full retirement age is 66 and you elect benefits at 62 then your benefits will be reduced by 20% for the first 36 months and 5% for the 12 month after, for a 25% reduction for electing early. Once you elect reduced benefits you will receive a reduced benefit for the entire time you collect Social Security. Spousal benefits are benefits that a workers’ spouse may be eligible for based on the workers’ record. In order to qualify for spousal benefits the spouse must be at least age 62 or have a qualifying child and has been married to the worker for at least one year prior to filing for benefits. Under these circumstances the spouse can receive as much as half of the workers primary insurance amount depending on the age in which they file for benefits or if they have a qualified child in their care. How are Spousal benefits reduced for filing early? Social Security benefits are reduced by a certain percentage for every month they are elected early. Spousal benefit reductions work the same way—though the factor by which the benefits are reduced is different. Below are the percentages used to calculate spousal benefit and retirement benefit reductions. Can a spousal benefit be increase by delayed filing? No. There are no increases to the amount of spousal benefit after the spouse’s full retirement age. What options are available to a single person? If you are currently single, and have never been married, you filing strategy will be dependent on life expectancy and retirement date. If you have a short life expectancy, begin benefits early or as soon as they would not be lost due to the earnings test. If you have an average or long life expectancy, delay benefits as long as possible, preferably until 70. This will likely maximize the present value of total benefits. In addition, since it provides the largest monthly benefit level at age 70 and beyond, it will minimize the risk of your portfolio running out of money in your lifetime. Do you qualify for benefits from a former spouse? Were married to that person for 10 years or longer. Are currently unmarried. If you remarried and your second spouse is deceased, you may qualify for benefits from either your first or your second spouse’s record, as long as each marriage lasted at least 10 years. Are age 62 or older. If your former spouse is deceased, you can collect at age 60 as a surviving divorced spouse. If your former spouse is deceased and you are disabled, you can collect at age 50. Does your former spouse need to file first? Survivor benefits are benefits that are payable to a spouse of a deceased worker. The spouse is eligible for survivor benefits after reaching age 60 (50 if disabled) and they are not entitled to a retirement benefit that meets or exceeds the survivor benefit. Taking survivors benefits before full retirement age will result in a reduction of benefits. A divorced spouse is also able to file for these benefits if they were married to the worker for more than 10 years. Does a spouse still qualify for survivor benefits if the worker dies before electing Social Security benefits? The surviving spouse’s age will determine the benefit amount. If the widow is of full retirement age, 100% of the deceased spouse’s benefit will be available to the surviving spouse. Any age less than full retirement age will reduce the benefit based on the age or situation. What benefits are children eligible for? How are benefits available to my child as result of a parent’s retirement or death? If you retire or pass away, your children may also qualify to receive benefits on your record. Your eligible child can be your biological child, adopted child or stepchild. A dependent grandchild may also qualify. be 18 or older and disabled from a disability that started before age 22. Normally, benefits stop when children reach age 18 unless they are disabled. However, if the child is still a full-time student at a secondary (or elementary) school at age 18, benefits will continue until the child graduates or until two months after the child becomes age 19, whichever is first. An important note about retirement benefits is that benefits paid for your child will not decrease your retirement benefit. In fact, the value of the benefits he or she may receive, added to your own, may help you decide if taking your benefits sooner may be more advantageous. What are Maximum Family Benefits? Within your family, each qualified child may receive a monthly payment up to one-half of your full retirement benefit amount. However, there is a limit to the amount we can pay your family. The total depends on your benefit amount and the number of family members who also qualify on your record. The total varies, but generally the total amount you and your family can receive is about 150 to 180 percent of your full retirement benefit. Is my child subject to the earnings limitation? If a child on your record works while receiving benefits, the same earnings limits apply to him or her as apply to you.